Big Box Retail: Why Are They a Problem? 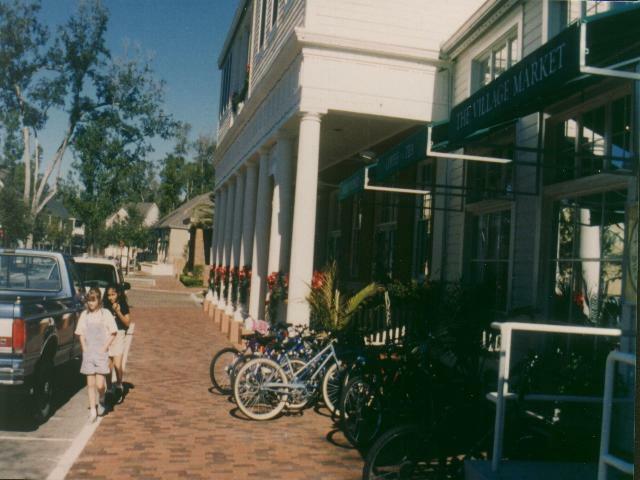 From 2004 till 2007, while I was a senior planner for Gainesville FL, I was given the task of preparing regulations to better manage what is commonly called “big box retail.” I conducted several months of research. The following is a summary of the problems I uncovered. America is under siege by an epidemic of Big Box retailers (that is, retail giants such as Wal-Mart, Target, Costco, Home Depot, etc.). Category-Killing Cannibals. Research shows that Big Box retailers do not create an improved retail environment for a community or result in a net increase in jobs. Instead, they tend to cannibalize existing, in-town retail sales and in-town (often locally-owned) jobs. This is true at both the local level and the regional level. No net increase in retail sales or jobs. Just a geographic shifting from existing businesses to the Big Box (a reason why Big Box is sometimes called a “category killer,” as all other retailers selling similar products are often wiped out because they are unable to compete). Retail Shifts to Community Periphery. Healthy communities have traditionally had their retail activity sprinkled throughout the community. Such a pattern promotes transportation choice and builds a sense of community. Because the predatory nature of Big Box kills off most or all of the smaller retailers in a community, and because the Box needs high-capacity highway access to serve regional markets, the number of retail outlets in a Big Box community shrinks and moves to the periphery. Such a location promotes car dependence. Breeding Car Dependency. Big Box retailers promote extreme levels of car dependency for those who live in the region—which is a lethal, downwardly spiraling trend. 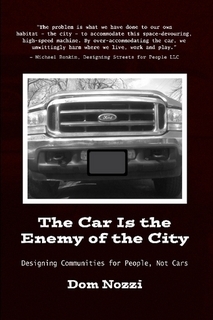 Excessive car dependency destroys community quality of life; significantly harms community sustainability; increases our dependence on oil, outside corporations, and foreign nations, bankrupts households and local & state governments; wipes out our downtowns; transforms us into an “anywhere USA” kind of place that eliminates civic pride and a unique community character; and ruins our natural areas. Such retailers are typically placed in peripheral locations (and have site design) which makes it impossible to travel to the store without a car. As a result, an increasing proportion of residents in a community must now make an increasing number of trips by car (thereby increasing car dependency). In part, this increased car dependency is caused by the fact that the Big Box wipes out in-town businesses that were accessible by means other than the car. Loss of Retailers and Choices. Big Box retailers, by extinguishing local businesses, reduces consumer choice in products, since increasingly, the only products available are those that are sold by the Big Box. Dollar Drain. Big Box retailers drain dollars from a community. Instead of cycling those dollars within the community, Big Box steadily impoverishes the community by forever draining wealth from the community and pouring it into the bank accounts of out-of-town executives which have no allegiance to the community where the Big Box resides—nor any care for the welfare of the local community (since they don’t live in the community being drained). Encourage Sprawl. By being so excessively car-dependent and designed to serve a regional “consumer-shed” of motorists from up to 10 (or more) miles away, Big Box retailers enable a sprawl lifestyle. That is, life becomes more feasible, and therefore induces more sprawl households because sprawl is now more attractive. Short-lived. 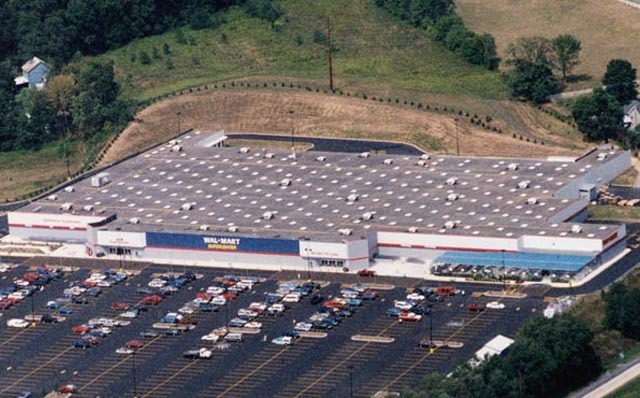 Big Box is infamous for abandoning their boxy buildings after only a few years, typically leaving a site with a building and enormous surface parking lot that is difficult and expensive to use for another purpose. Many communities have responded to such a problem by requiring the Big Box to sign an agreement that requires that, for example, the site be restored should the Big Box decide to abandon the site. Large, dangerous roads, parking lots, intersections. To survive and thrive, Big Box must be designed and located to efficiently serve a regional consumer market that extends several miles from the Big Box. This requires the construction of extremely large roads, intersections and parking lots. Communities often make the critical mistake of obligating large roads, intersections and parking lots for the prospective Big Box, naively thinking that such infrastructure will lessen the undesirable impacts of the Box (or even discouraging the Box from locating in the community). Unfortunately, large roads, intersections and parking lots are precisely what the Big Box needs to thrive, and they are more than happy to either provide these facilities themselves or, better yet, have public tax revenue subsidize the construction of such facilities. These over-sized roads, intersections and parking lots that serve the Big Box end up worsening the situation, because they end up promoting the further proliferation of Big Box retail and strip commercial development. Huge roads and parking also reduce transportation safety and transportation choice, and often end up congested despite their large size (because the roads and parking are free to use). Ugly, “Anywhere USA” appearance. Big Box is notorious for building “boxy,” national formula building designs that ignore local character and tend to look identical throughout the nation. Left uncontrolled, this can lead to a significant loss of a unique community character and decline in civic pride. In sum, Big Box retail is a menace to communities – economically, aesthetically, and in terms of quality of life and sustainability. Fortunately, there are many tools that can be employed to lessen the undesirable impacts of the Box (which I will discuss in a subsequent blog), and communities must get ahead of the curve and have such regulations in place before proposals for Big Box are submitted to local government officials. Who Is Responsible for the Car-Happy Road Design America is Afflicted With? 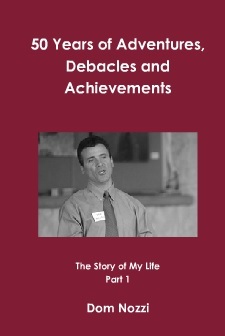 Recently, I came upon an essay entitled “Confessions of a Traffic Engineer.” It was written by an engineer who had come to learn that nearly all of the road designs he felt obligated to recommend for his community were counterproductively creating roads that were unsafe and in other ways destructive of important community objectives such as quality of life. Clearly, America’s road system is ruinous and miserable (not to mention unaffordable). And a bitter irony is that the more public money we spend on a road, the WORSE the road becomes. The more we hate it. Shouldn’t it be the reverse? Are traffic engineers solely to blame for the awful road system that has been built in America? In my view, we are ALL part of the problem. Engineers have flexibility with their road design manuals. It is therefore somewhat of a cop-out for the engineer to blame the design manuals — be “a good German” and recommend something they know (or should know) is counterproductive in so many ways. In my work as a city planner, I often had an “obligation” to follow planner “manuals” (zoning codes, city policies, etc.). Many planners know that what we are recommending is counterproductive, but some of us decided not to be Good Germans and sometimes were able to object in various ways without threatening our jobs. Both engineers and planners are hired to give a PROFESSIONAL recommendation about what the community should do. It is a violation of professional ethics to recommend actions that worsen the community. Sometimes it is a matter of the planner/engineer being patient. Waiting for the proper crisis or the right elected officials before making helpful recommendations. Elected officials are sworn to represent their community to make it a better place. They have a fair amount of power to request their staff make recommendations that are in the public interest (more power than staff or citizens). They give engineers and planners PERMISSION to make important recommendations. Elected officials, when they are leaders, are willing to take actions that they know will make many people unhappy (at least initially unhappy). Those who don’t make such decisions generally don’t make anything meaningful happen. I am well aware of the fact that this power is significantly diluted when one is part of a 5- or 7-member elected body, instead of being, say, a governor or president. Citizens, by and large, are enormous advocates for bigger, less safe roads, as most are adamant that they be able to drive at high speeds to minimize their travel time (its only THEIR neighborhood streets that they generally want to be narrow and low-speed). Citizens therefore strongly demand road widening to “ease congestion” and speed up traffic. This makes it extremely difficult for elected officials, in a democracy, to make decisions which are counter to road widening demands by citizens. But citizens are responsible for keeping themselves informed on important community issues, and voting for quality elected officials. They have a responsibility to know what makes sense, overall, regarding community issues such as transportation. Ultimately, it is voters who decide if the community will elect people who “get it” regarding transportation (and other issues). Since elected officials, in turn, have a fair amount of power to direct the actions pursued by staff, one could say that it all starts with citizens. Citizens vote to elect officials. Officials have the power to direct staff. All three groups – traffic engineering staff, elected officials, and citizens — are powerfully affected by an overall car-centric system. A system that creates strong pressures and incentives to perpetuate a dysfunctional, unsustainable, car-happy world we find ourselves in. Corporations that make cars, that produce oil/gasoline, that sell car-related products and services and a great many other car-support companies creates a national economy where a huge percentage of all jobs are car-based jobs. It is therefore an economy that depends on our being completely dependent on car travel. 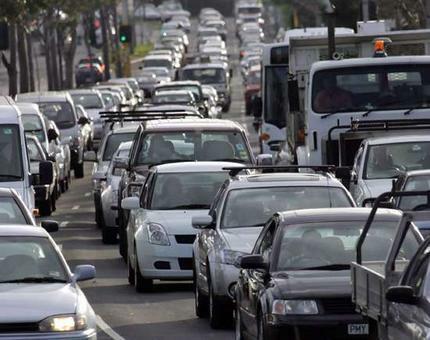 We have an economy, then, that is utterly dependent on perpetuating car-dependent sprawl. Engineers, politicians, and citizens are all powerfully influenced by this sprawl machine via advertising, huge campaign contributions, funding for research, local land development regulations, our dispersed land development patterns (caused by car subsidies), the price of gas and parking for motorists, taxes, etc. Given all of this, we will need to see enormous and often quite painful changes in our world if we expect any meaningful, sustainable, positive transportation actions on the part of citizens, elected officials or engineers/planners. Gasoline, road use and parking prices will need to be a LOT higher, for starters. The cost of widening roads must also be a lot higher, although we are starting to see some parts of the country be “enlightened” about doing the right thing with transportation. Not so much because they were educated by brilliant people or brilliant ideas, but because, for example, there is no longer an ability to be able to afford to widen a road from 6 to 8 lanes. Overall, I’m optimistic. I believe that some of these costs are starting to influence thinking and actions in a positive way. There are faint hints that a tipping point is starting to be reached. In the meantime, however, we are ALL responsible for creating an awful, shameful, car-crazed world. What makes a town or neighborhood? How do we know that a place is designed to successfully create a town or neighborhood? Recently, these questions came up for me when a friend of mine indicated that a new urbanist “town” in his Florida county was not really a town. He also indicated his fondness for disconnected cul-de-sac neighborhood streets (albeit linked with bike paths). When I thought about what my friend had said, I first wanted to remind myself of the problems I have come to learn about in both my research and in my life experience with cul-de-sacs. Studies show, overwhelmingly, that those living in disconnected cul-de-sac subdivisions drive significantly more car miles. Such residents therefore walk, bicycle or use transit significantly less than those living in comparable neighborhoods with connected, gridded street design (with relatively short street block lengths). It is not a coincidence that the timeless, lovable, compact towns that were built when most people walked are also towns that, almost invariably, have connected, gridded streets with short block lengths. This is predictable, as a connected, gridded, compact street pattern is much easier to use by pedestrians, bicyclists and transit users (which were the primary forms of travel when such streets were built). Only a car-dependent society is able to tolerate disconnected, curvilinear streets. As a result, I am not surprised that I know of no disconnected cul-de-sac subdivisions where a meaningful number are walking, bicycling or using transit. Disconnected cul-de-sac subdivisions forces all residents to drive a car nearly everywhere for at least two important reasons: (1) cul-de-sacs result in substantially increased distances, as disconnected roads very often force you way out of your direction of travel (or force you to backtrack); and (2) because contemporary, “modern” cul-de-sac subdivisions almost never incorporate any shops or jobs in the subdivision. Consequently, even if the streets in a cul-de-sac subdivision are connected in the future by bike paths, as my friend suggests, the distances remain enormous. Furthermore, by disconnecting streets with cul-de-sacs, nearly all car trips are forced onto a tiny number of major roads (called “collectors” and “arterials”). That means that even with a relatively small number of motorists, the roads quickly become congested and angry demands start emerging almost immediately from residents of cul-de-sac subdivisions to install turn lanes and additional travel lanes (further making bicycling and walking less safe). Because all trips are forced onto a few large roads, it is extremely inefficient to spend huge sums of money to build smaller roads that hardly ever get used (except by the tiny number of houses fronting the cul-de-sac). Inefficiencies are also created with such disconnected roads in the delivery of public services such as mail delivery, garbage pick-up, fire response, police response, and medical response. Providing these services becomes significantly more costly due to back-tracking and indirect routing that cul-de-sacs cause. One typical and almost inevitable result: the local government is forced to raise taxes to pay for the higher service costs. When streets are connected and therefore without cul-de-sacs, by contrast, car congestion is much less likely as car trips are dispersed on several connected roads. That means, among other things, that road expenditures are much more efficient. We’re not spending huge sums to provide for two or three car trips each day. As for connecting cul-de-sacs with bike paths, it’s a nice idea that most town planners earnestly call for when subdivision plans come in, but the reason that only one out of a thousand cul-de-sac subdivisions have such path connectors is that contemporary cul-de-sac subdivisions are catering to an isolationist, privatopia lifestyle where folks are TERRIFIED that bike paths will be used by homeless, criminal, drug-dealing terrorists. Such people would either not buy a home if the cul-de-sac subdivision had such paths initially installed (lending institutions might also not lend if such paths were proposed), or they would scream bloody murder if there were a proposal to retrofit the paths at the end of cul-de-sacs after the homes were built and occupied. 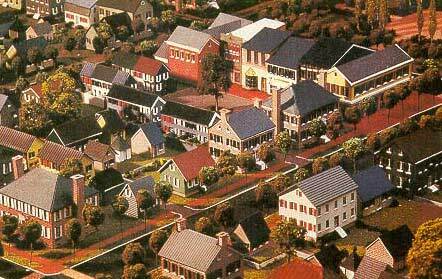 Given all of the above, cul-de-sac streets effectively isolate households from fellow citizens. Such isolation fits well with those seeking a “cocooned,” privatized lifestyle that turns its back on the public realm. Such places are typically where we find people spending every night in isolation in front of their Big Screen TVs, and never interacting with their neighbors. The design, in other words, is one where we find a collection of loners. For all of the above reasons, it is not surprising that the State of Virginia has recently banned or at least strongly discouraged new cul-de-sac subdivisions. What Are the Essential Elements for Creating a Town or Neighborhood? By striking contrast to the disconnected, cul-de-sac subdivision, there are at least four features that must exist for the creation of a quality town or neighborhood. First, houses need to be within a short walking or bicycling distance of the most important regular tasks of the household. Those tasks (or trips) include jobs, shops, services, culture, public meeting places (such as parks, squares or plazas) and civic institutions. Places conducive to true towns and neighborhoods provide “Third Places” (think of a neighborhood pub, or the TV show “Cheers”). Neighborhoods and towns also provide “social condensers” and other features which nurture a sense of community and sociable conviviality and neighborliness. Sidewalks – the most common form of social condenser — are therefore found on both sides of most or all streets. Each day, people interact with many others in their vicinity, and regularly enough so that a resident typically knows a large number of people on a “first name” basis. As Jane Jacobs famously noted, lowly, unpurposeful and random as they appear, sidewalk contacts are the small change from which a city’s wealth of public life must grow. Neighborhoods and towns have connected streets with short block lengths, and the streets have low design speeds. Such design is essential for minimizing trip distances and maximizing travel safety, both of which are extremely important in inducing travel by foot, bicycle, and transit. The geographic size of the place and the design of its streets are such that it is safe, convenient and pleasant to walk, bicycle, use transit or drive a car to get to most or all of the important needs in one’s day-to-day life. By contrast, places without such street design tend to induce exceptionally high levels of car travel, which isolates people from their fellow citizens, increases travel dangers, and harms residential property values. Finally, residents of real towns and neighborhoods tend to know the boundaries of their town or neighborhood, which gives their place an identity. One result is the possibility of feeling civic pride, which is essential in creating the all-important desire to protect and improve your town or neighborhood. The vast majority of cul-de-sac subdivisions that have been built in America since the 1930s are unlovable, unsustainable and therefore doomed to have a short life before they are abandoned and bulldozed. Well-designed places are those containing the four ingredients I describe above, and are likely to produce, in the long run, places we will love, protect and cherish. Occasionally, in my work, I will have a young person ask me for a suggestion about what line of study should be pursued for a person seeking an education or degree that would help them find a career that would allow them to help implement some of my recommended urban design principles (largely, to return to the timeless tradition of designing to make people happy, not cars). Such requests are rewarding and immensely flattering for me to receive. Below is a summary of some of the recommendations I would offer to a new student seeking a career in town planning and environmental conservation. First, it is essential that a student thinking about a career in town planning identify what he or she is passionate about. When a passion is found, the student is able to be self-motivated to enjoy learning as much as possible about the field for a lifetime, and to find a career that is so enjoyable that the person is more than happy to pursue the work without even being paid to do it (of course, being paid is an extra bonus). For me, I discovered in 1989 – three years after I obtained my master’s degree, somewhat sadly – that my passion is new urbanism. Admirably, many students seek a career that will enable them to promote and restore our natural environment, in addition to doing work that will improve towns and cities. A crucial, counter-intuitive point for such a new student to understand is that in cities, fighting to reduce traffic congestion is detrimental to the environment (despite the conventional wisdom, which wrongly believes that less congestion means less air pollution and gas consumption – the reverse is true). Fighting congestion is counterproductive because nearly all the tactics to do so make driving a car easier (road widening, etc. ), and that increases unsustainable driving and sprawl. The beneficial tactic for the environment, economics and quality of life is to create ways to avoid the congestion that inevitably occurs in quality communities. More in-town density, mixed use, connected streets, etc. Much of our future – particularly the future for planners, engineers and officials – will be to retrofit and renovate our roads and buildings and communities to correct our car-happy, unsustainable mistakes of the past. The future lies in smaller roads and more compact, self-sufficient, lovable communities. And that means it will be important for a student to emphasize urban design and drawing skills in their academic work. Other essential skills include diplomacy and negotiation, public speaking skills, and writing skills. To work as a town planner or urban designer, the student will need to obtain a master’s degree. Assuming a new student finds passion in new urbanism as I have, it is obviously essential for a student to select a school and professors who are sympathetic to the concepts of new urbanism, transformational transportation concepts sympathetic to new urbanism, or those who strive to restore the tradition of designing for people rather than cars. I envy the new student of town planning these days, as these are very exciting times to be starting off in the field. Our society, for a number of reasons, is seeing a paradigm shift in how towns are designed, and how transportation between and within our communities occurs. We are entering a time where a transformational “Plan B” is needed in order to contend with troubling energy, economic, and resource constraints. The result is an explosive growth in the need for planners and designers who are skilled in the principles of restoring towns to the timeless, people-centered traditions. The design of towns that are sustainable. Towns that we can love.